There are many Hurricane kits on the market already, especially in 1:48 scale, and one can wonder why a brand like Italeri took the decision to add another one to the list. Like their previous quarter scale release, the Ju 87 Stuka kit, this new tool is now directly in competition with the Hasegawa offering. Let's see if it compares well with the latter. - 4 sprues of grey colored injected plastic parts. - 1 sprue of transparent parts. - 1 photo etched fret. The quality of the Italeri productions can be disconcerting to say the least. Between numerous reissues originating from various brands (Accurate Miniatures, AMT, Dragon, ICM, Kinetic, Ocidental, Special Hobby, etc...) the Italian brand also produces it's own kits with very variable results. While some are really bad (the 1:48 scale Reggiane 2002 comes to my mind), some other are decent like their 1:48 scale Macchi 200 or the Ju 87 Stuka. Fortunately, this Hurricane release can be considered one of Italeri's best efforts, if not the best in the most recent years. The quality of the plastic parts is quite good with a very nice rendering of the rear fuselage's fabric structure. This is something important as it has a big impact on the overall look of a Hurricane model. The panel lines are a little soft and on the heavy side though but not as much as previous releases like the Reggiane or the Macchi. Overall I'd say that the surface detail of the Hasegawa offering is slightly better but not as much that the Italeri one wouldn't represent a serious alternative. I found three sink marks on the outside surface of the right fuselage part because of the locators for the cockpit assembly. They will be easy to eliminate with some filling and sanding though. Traces of flash are very limited. Spue A holds the fuselages halves, the interior detail and a detailed engine. Some cowlings panels are separate so it will be possible to display the power plant on the finished model, but there is no structure depicted inside the cowl parts. The fact that the rear underside of the fuselage is an optional part indicates that other variants will follow (Sea Hurricane or early marks?). The tubular structure of the cockpit is not molded directly on the fuselage parts but comes as extra parts which are of course more realistic. Once assembled, The pilot's office should be busy enough for most modelers, especially since a photo etched instrument panel and seat belts are provided. Sprue A also holds inserts for the four machine guns openings on the wing leading edges. This is also an indication that other variants equipped with different armament will follow. Sprue B is composed of the three piece wing assembly (later metal skin variant), separate control surfaces (ailerons and rudder), two types of spinners and landing gear covers. The surface of the wing is well done and there are no oversized relief details this time like it was the case with the Arado Ar196 model of the same manufacturer. The transparent sprue provides a windshield and a separate sliding hood plus other smaller bits (landing light covers, formation lights, etc...) The transparency is excellent. The very small but nevertheless welcome photo etched fret, as mentioned previously, features an instrument panel and seat belts as well as very delicate hand holds for the sliding hood of the canopy. A - Hurricane Mk.I n° 242 Squadron, F/O W L McKnight, Coltishall, December 1940. B - Hurricane Mk.I n° 151 Squadron (American Eagle), P/O J Havilland, Digby, October 1940. C - Hurricane Mk.I n° 605 Squadron, S/L Ashmore McCellar, Croydon, November 1940. 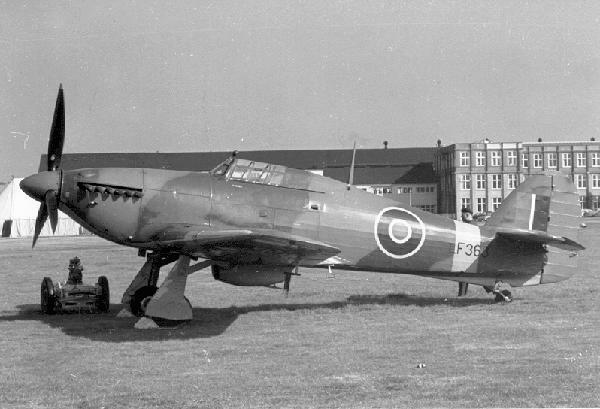 D - Hurricane Mk.I n° 303 Squadron (Polish), F/O W. Urbanovicz, Northolt, September 1940. E - Hurricane Mk.I n° 69 Squadron, Luqua airfield, Malta, 1941. F - Hurricane Mk.I 1st Fighter Squadron, Shannon A.B. Rineanna, Ireland, 1943. All the aircraft carry the Dark Green/Dark Brown camouflage scheme on the upper side, except the Malta machine which is overall Azure Blue with a Middle Stone/Dark Earth rudder. Sky "Type S" is the color of the underside for options B, D and F. Machine A has "Eau de Nil"/ Black underside colors, machine C Duck Egg Blue and E, as said previously, Azure Blue. The decals have been printed by Cartograf and are very nice, as one would expect from the Italian brand. Details are very crisp but they are very glossy. The kit's instructions are printed in black & white on A3 format paper folded so to constitute a 16 page A4 size booklet. Included are a history of the aircraft, a part layout diagram, 8 pages of instruction drawings (16 steps) and one page with four view drawings for each marking options. Paint references are given for the Model Master range of colors as well as the new Italeri Acrylic paints. The back of the kit box has some profiles printed in color which accentuates the overall good impression of the package. Icing on the cake is the presence of a small (A5 format) but nevertheless very handy reference book of 36 pages printed in color. Included are technical notes, period photos, original technical drawings as well as walk around shots of preserved aircraft. The book does not only cover the Mk.I but also other variants which is maybe an indication of things to come. - Two different wheel hubs. - Two propeller types (Hasegawa only provides one type in a box depending on the variant). - Six marking options rather than two (and the decals are better). Once assembled, I'm sure the final appearance of both models will be very similar so this shouldn't be a criteria. If you don't need an engine and movable surfaces, and if you can find the Hasegawa model cheaper, there is no reason not to buy it. However, if you like the features of the Italeri kit, by all means, don't hesitate, especially since it provides such a nice decal sheet and reference booklet. I have already built one Hasegawa Hurricane and I have two others in the stash which I will be happy to build. But I know I will also get all the Italeri Hurricane variants when they will be available. N.B. The pictures accompanying this review sometime show the Italeri kit parts compared with the Hasegawa ones. The Italeri kit has light grey parts while the Hasegawa kit is made of dark grey plastic. Sometimes there are some visible differences (spinners! ), check them out. This is a very nice model from Italeri and if you like the options provided a worthy alternative to the Hasegawa one. I would place them on the same level as they will both produce a very fine model. In the end, availability and price will surely constitute the main criteria for it's purchase. Overall, this is a very good package. Highs: Engine included - Movable surfaces - Many options - Great decal sheet. Lows: Detail is soft in some places. Verdict: Overall, a very good package and a real alternative to the Hasegawa kit. actually, hurricanes had several types of spinners, so both are potentially (but perhaps not actually) accurate. compare: even the top and bottom images seem to have slightly different spinners despite being similar in shape. Three types: de Havilland - short and pointed - 3rd photo. Rotol - short and blunt, bulbous, same as fitted to Spitfire Mk II. 2nd photo. Rotol long chord - long and pointed - specifically designed for Hurricane to replace the Rotol borrowed from the Spitfire. 4th photo. First two fitted to Hurricane Mk I, the Rotol long chord was fitted to later built Mk Is and other Mks. "...except the Malta machine which is overall Azure Blue with a Middle Stone/Dark Earth rudder. " That’s not correct. 69 Squadron carried out reconnaissance duties and their Hurricanes were tasked with the sorties over the most dangerous targets. P3144 was locally modified by lightening the airframe and fitting two cameras. Land Temperate (Dark Earth/Dark Green) pattern A was the original scheme not Dark Earth/Mid Stone. It was over painted with a locally mixed ‘Matt Royal Blue’ colour made from five gallons of De Luxe Boston blue, seven pints of turpentine, 16 lbs of zinc powder, and 3 lbs of De Luxe black. The fin and rudder were not re-painted and left in the original Dark Earth/Dark Green.